During the past 12 months, our cockers retrieved a substantial number of upland birds; a multitude of ducks; two hare; and one insolent, crow. This bounty - except for the crow - went to our freezer, and eventually to our table. We don’t eat the socks, pot holders, cloth napkins, firewood, spent shells, and shot wads they retrieve without being asked; we forgive them for that. They are irrepressible clowns, and ours often get away with some things they shouldn’t because we’re laughing too hard to discipline them. They are our dogs for all seasons. Dutch brings in a black duck at low tide on a snowy Maine day. During upland bird season, the cockers earn at least a part of their keep working for my Maine Guide husband. During the waterfowl season, the dogs don their neoprene vests for duck-hunting adventures here on the coast. In late winter when we’re ready for some warmth and more action, we might take off for Mississippi and some quail hunting. Springtime and early fall bring hunt tests and field trials, goals to shoot for, plus we love hanging out with dog people. Cockers are fierce on pheasants, a bird that seems to bring out the best, and occasionally the worst, in our dogs. They don’t give up on cripples and if necessary will follow birds underground to retrieve them. Wild pheasant abound on some of our Maine islands, and a privileged few of us get to hunt them - aren’t we lucky?. The warm ocean water moderates the island temperatures; there are no significant predators, and acres of wild roses cover vast areas of the islands, where the pheasants hang out. Few humans or self-respecting dogs would attempt following a runner into the thorny muddle, but the cockers like the chaos just fine. I must say it is a bonus to hunt pheasants with the Atlantic Ocean and working lobster boats as a backdrop. It is also a kick to get there in a four-seater island hopper with the dogs peering out airplane windows just as if they were in the pickup. On the mainland, we have few pheasants, but do see a healthy number of grouse and woodcock. We hunt the heavier cover on the peninsulas where a close working dog is a must. They quarter through what would be impenetrable cover for most dogs and all humans. And when they encounter promising scent, their pace shifts into high gear, the wagging tail becomes a blur, the nose does some serious ground work, and their pattern becomes excitingly erratic. Eventually, we hear the flush, and hopefully we have enough of an opening to get a clear shot. Sometimes a confused bird flies right at us in an effort to escape the charging spaniel. When you live on the Maine coast you see ducks everywhere and new priorities surface. 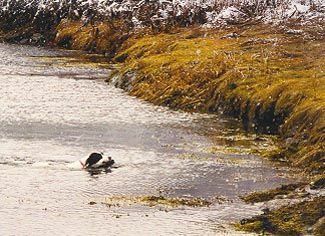 Several years ago, a full day’s upland hunt was all we expected from our flushing dogs. 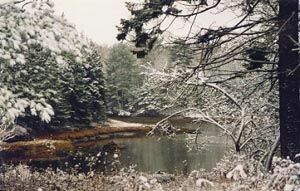 But,.. when you live on the Maine coast, you see ducks everywhere, and new priorities surface. During duck season, if we have a precious hour of down time, we slip on the coveralls, grab our 12-gauges, and call the anxious cocker with the liver and white face. We head out the door, walk down the drive, and disappear into the thick spruce woods. The three of us take our positions at the edge of the woods along the rocky cliffs of the river and wait; this particular cocker waits well. Forty minutes later we can be back, two shells lighter, with the dog displaying a fine drake golden eye for the benefit of his jealous canine companions. One day on the way home from the post office in our small village, we saw a flock of black ducks drifting and working their way along the edge of a narrow cove. They were feeding on the incoming tide, so we turned off the blacktop and followed a narrow tote road in as far as possible. My husband grabbed the shotgun and ammo; I grabbed the black cocker - the one who doesn’t wait so well.